One of the things I love about Wholly Guacamole is how generous they are. I've been a Wholly Guac blogger for about a year and these guys always seem to amaze me with just how generous they are and how much they are willing to help others. And now you can help them by becoming a HERO! Get a shirt and two FREE Wholly Guacamole coupons! 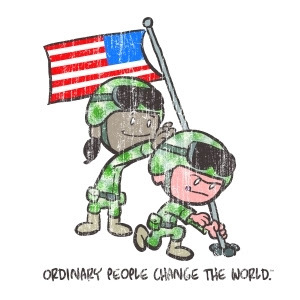 Help send 100 military kids to summer camp. The Wholly Guacmaole company teamed up with Brad Meltzer, founder of Ordinary People Change the World and Operation Purple, a program of the National Military Family Association. Please help them reach their goal! Each shirt is $10 and the ENTIRE $10 goes towards their goal in hopes of selling 5,000 shirts! The program ends, October 31, 2012, so get your shirt and Wholly coupons before it's too late. Disclosure: All opinions are my own. I am a Wholly Guac Blogger and receive products to test out and share from time to time. No post was required. No compensation was received.